Our prayers and our thoughts have been with the family of Alan Henning over these last weeks, during which his life has been so publicly threatened. In his life Alan Henning united people across the boundaries of nationality and faith. He did so both through his humanitarian actions and by the love that drove him on. That his tragic death continues to unite people across Britain and beyond is demonstrated today by the range of people and organisations paying him tribute. To ISIS we say: You no longer have the power to shock us, now you just sicken us. Your brutality, against any who don’t share your narrow, perverted worldview, doesn’t undermine our determination, it stiffens our resolve. Your destiny is not to be a force in human history, merely one of its sad footnotes. These are the words of David Walker, Bishop of Manchester, in whose diocese Alan Henning had lived. As we have read similar statements posted across social media and on the news, there has been a palpable sense that we are a nation in mourning for one of its sons. Having a strong sense of charity and acting to help others in need on a global scale runs deep in the British psyche. You only need to look to our Government’s International Aid commitments to see that we are one of the most generous nations in the world. Alan Henning embodied that spirit. He took unpaid leave to swap driving a taxi in Eccles for an ambulance in Syria full of food and water to be handed out to anyone in need. Before crossing the border from Turkey to Syria he was filmed saying: “It’s all worthwhile when you see what’s needed actually getting to where it needs to go. The sacrifice we do is nothing compared to what they go through on a daily basis.” Within hours of speaking this he was abducted and taken hostage, ultimately making a sacrifice far bigger than he had ever planned. ISIS have repeatedly shown that they have no interest in the dignity of anyone they have decided is their enemy. They have also dismissed the concerted efforts of Muslims in this country to show mercy. Letters and messages from numerous imams have fallen on deaf ears. The ISIS corrupt and depraved ideology has blinded them and hardened their hearts beyond the point of no return. But in this blatant and public disregard for any form of benevolent justice they are continuing to sow the seeds of their own destruction. The more these murders continue, the more isolated ISIS will become, and the urgency to see them destroyed will only increase. Alan Henning’s mercy and compassion are far easier to justify in Islamic teaching than ISIS terror and brutality. They live by the sword and most likely it will be the sword that causes their fall. No regime or state displaying these levels of evil has historically lasted more than a relatively short length of time. The innate goodness in of humanity has always risen to do what was needed to overcome these sick and twisted aberrations. Right now we are witnessing the worst that ISIS can do, but it will not last. They will be swept away without any mourning. But we have a duty to remember and celebrate the life of Alan Henning and other ISIS victims who lost their lives because they cared enough to put themselves in a place of danger. 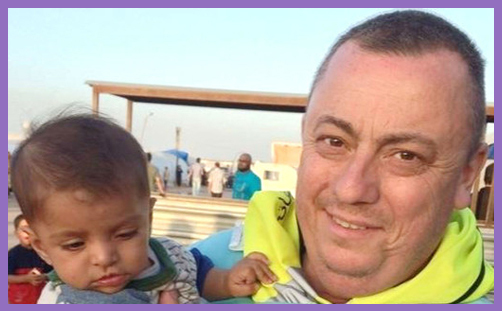 Let us also not forget Alan Henning’s family at this time, and pray for their strength, courage and the healing of these bitter wounds.